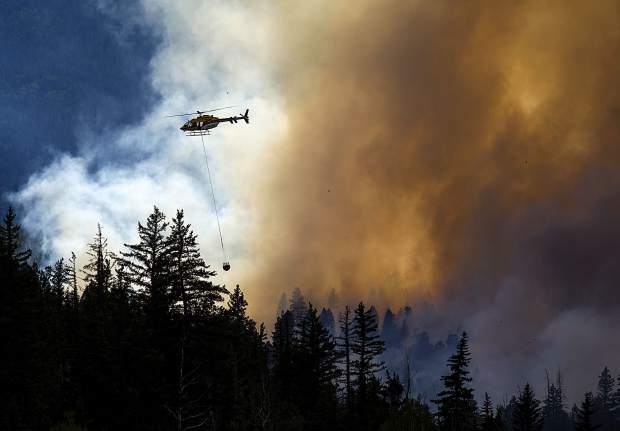 A helicopter transports water to contain the Weston Pass FIre Monday, July 2, near Fairplay. The Weston Pass fire continues to burn south of Fairplay, growing from 6,500 acres to almost 9,500 overnight, with zero percent containment as of 11 a.m. Tuesday, July 3, according to Inciweb, an interagency incident information management system. More than 400 firefighters are actively engaged with the blaze, which ignited after a lightning strike hit nine miles south of Fairplay on Thursday, June 28. Evacuations remain in effect for Black Mountain south of County Road 22 and Campground of the Rockies. Black Mountain north of County Road 22 and Thousand Peaks are under voluntary or pre-evacuation notices. The fire is currently a mile northwest of Campground of the Rockies, and officials are nearing completion on a structure protection plan. Meanwhile, firefighters are working to establish a line along Forest Service Road 168 to remove fuels between containment lines and the fire’s edge. Officials are setting up dozer lines along Forest Service Road 443 west toward 431 that will act as the southern primary containment line to hold the fire. The forecast over the next few days also won’t bring any relief, as officials are expecting low humidity and high temperatures, along with moderate winds. The Sugarloaf fire remained relatively stable Monday night, July 2, as it continues to burn 1,214 acres southwest of Fraser. About 1 percent of the perimeter is currently contained, though no homes or businesses are considered to be in danger. Fifty-one firefighters are on scene, accompanied by four engines and a Type 3 helicopter. Two Type 2 helicopters have been ordered to help stop the fire from crossing the main Darling Creek drainage and to slow fire activity southwest of the main fire. There is currently a red flag warning in affect in the area, with a possibility of isolated showers and thunderstorms south and east of the fire. Southwest winds of up to 20 mph are anticipated in the fire zone.